While many businesses and brands remain undecided about the future of marketing on Facebook, the social media giant seems to be looking to transform how businesses and customers utilize and interact with their platform. If you’ve searched your favorite brand on Facebook over the last few days, you were probably caught off guard and confused. Amidst numerous scandals, Facebook is now beta testing a new rating system for business pages. Previously, these pages were similar to users profile pages, with the exception of reviews and star ratings being displayed towards the top on a 5-star scale. It was simple, it highlighted star ratings based on reviews; it was easy for users to contact the company via message or wall post or to leave a review. Facebook is now reportedly incorporating aspects such as recommendations and business’s response times to inquiries via private message into the overall rating of a business. Facebook is ditching the 5-star scale and opting for a rating scale from 1-10, with 10 being the greatest your company can be rated — at least for now. In addition to using the sentiments within reviews on a business’s page, Facebook is now reportedly incorporating aspects such as recommendations and business’s response times to inquiries via private message into the overall rating of a business (see image below). Because this is still being tested out by Facebook, it’s unforeseeable whether or not these changes they’re testing out will stick around for the long haul. However, being informed of this current layout and rating scale change will keep you ahead of your competition and engaged with your customers. One crucial change to note is the rating scale difference in Facebook’s beta test of their new rating system. 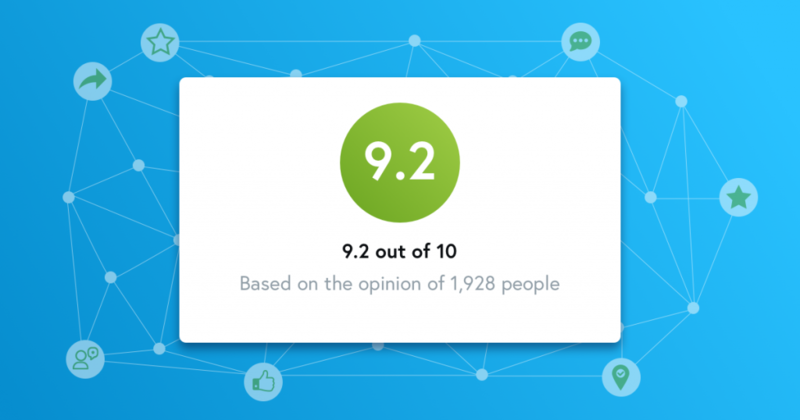 Previously, a user would rate your business on a 1-5 scale; with each review influencing the overall rating of your business. With the new rating system in place, a user can choose to “recommend” or “not recommend” in regards to your business, and can then provide additional feedback (see image below). While they’re testing out these potentially new features for business pages, now is the ideal time for you to utilize this newly found, direct access to consumer insights regarding your business, and use it to your advantage. Currently, if a Facebook user stumbles upon your page, they’re going to see a section that highlights keywords found throughout the recommendations the platform has stored for your business; putting them on display for all to see. As a business owner, this gives you a snapshot of what your customers really feel about their experiences with your business. Let’s say you’ve been a bit disconnected from your customer base, but are looking for a place to start digging into their experiences with your business. With these beta tests being implemented by Facebook, most pages, if visited while logged into a Facebook account, will utilize the layout and scale that’s being tested. As a business owner, this gives you a snapshot of what your customers really feel about their experiences with your business by simply looking at the keywords most often used in the recommendations of your business. Maybe you regularly maintain your online reputation and have hand on the pulse of your customer-base, yet you see with this new rating scale that your business has a 4 out of 10; even with 95% four or five-star reviews on your page. This could signify that, while your customers are having a good experience with you face-to-face, when it comes to communicating with you digitally; your business falls short. Translation: your response time is . . . lacking. There are various other ways you can utilize the new look of business pages on Facebook and gain invaluable insight to redesign your approach to customer’s experiences with your business. While it’s unknown what Facebook intends to do with this testing or whether this is the new direction of business pages or not; the team at ReviewPush is keeping a keen eye on the matter to ensure our platform is best serving our customers and the wellbeing of the businesses they represent. We have published and updated post regarding these, and other, changes recently made by Facebook. Click here to read up on these updates and how to manage them. Be sure follow our social accounts for up-to-date information regarding any additional changes.